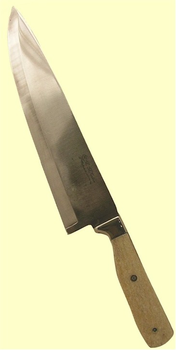 What makes either length of our carefully-designed Classical Chef's Knife such a favorite of all who use it? First, it is hand-crafted from 440C stainless steel, a favorite steel of both knifemakers, as well as chefs the world wide for its edge-keeping ability and easy sharpening. Second, the blade is hollow ground for sharpness. Third, these blades are the most sought after lengths for most kitchen chores - Our 8 inch blade is 12 3/4 inches overall - The 10 inch blade is 14 1/2 inches overall. Both have nickel silver bolsters, classy red Australian padouk wood liners, and, instead of the usual rivets, we used two "Morning Star" mosaic pins to fasten the comfortable Fossil Walrus Ivory handle! Either of these gorgeous knives will be a joy to use and will quickly become your "go to" kitchen tool! A perfect gift! Comes with soft zipered storage case.